We found it hard to decide what we should do with our 100th blog. In the end we have chosen to celebrate the milestone by highlighting a welcome Brixton attraction that provides both creativity, food and a really good playlist. 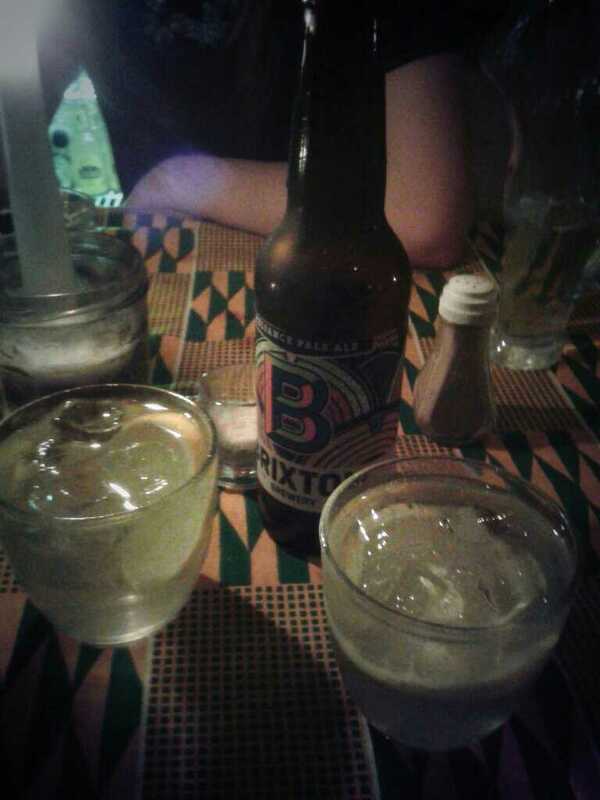 Every Thursday Friday and Saturday Rosie’s café turns into a Brixton nightspot until – Sean’s bar. This is not your usual bar – beer is served but it is often in the cocktails. It can all be accompanied by quails eggs and anchovy toast … how Brixton is that! This is a place to unwind in. It can be loud and bouncing on a Friday but on a Thursday…well that’s when you can really listen to the music and muse about all those things you plan to do with your life and the next weekend. Choose from a variety of cocktails – half a dozen regulars and always two specials. Spritz the night away with wine, Aperol and soda – ubiquitous in Italy at this time of the year and it turns out this was also Sean’s favourite hang out for finding cocktail recipes. The special is a New York sour (float of red wine) or a Limoncello Fizz (homemade Limoncello and Prosecco). I find Limoncello a tough one. The first drink is definitely the worst – all sherbet and sugary – but by the third drink everything seems absolutely fine. But if you want something a little more conservative try a Twinkle (Vodka, Elderflower and Prosecco) or a Vodka Expresso with — of course — Vodka, Caravan Espresso and sugar. 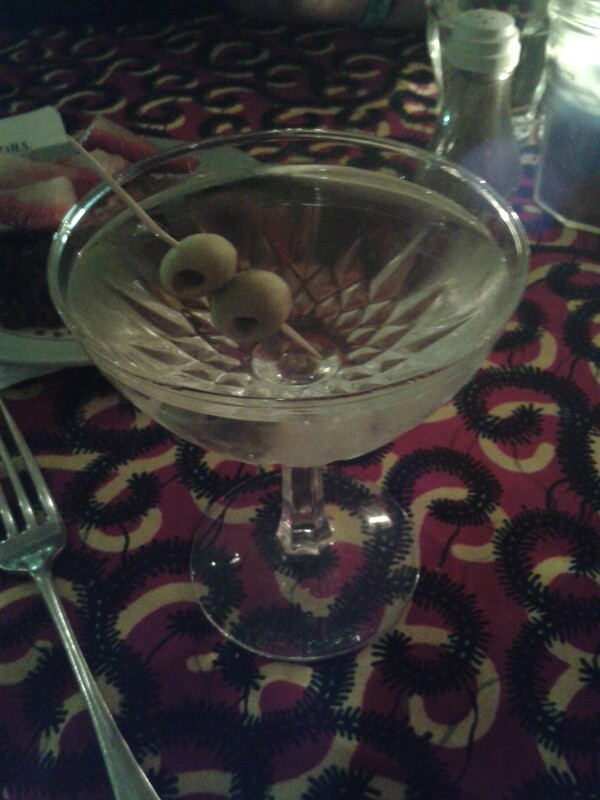 A few week’s ago they made my day by serving my favourite – a dirty martini. I’m pretty specific about my brine to gin ratio and this one surprised me by actually getting it right! To prevent the hangover, food is definitely needed and in addition to olives there is wild boar salami and prosciutto as well as some specials. For something a bit more substantial there is a croque monsieur, pork pie and piccalilli, or truffled macaroni cheese. We’ve only ever tried the macaroni, which is a perfect snack to share over your cocktails, with the cheese and pasta helping to line your stomachs. On another visit we were definitely there just for the alcohol, despite our aim to remain sober for at least a couple of days a week. So we had a New York sour and a classic daiquiri. Both were delicious and not at all small as are some of the cocktails we have drunk in the Village. These were sipped to the sounds of Northern soul, the Kinks and Martha and the Vandellas, a great playlist. The two drinks we had came to £13.00 and the food would cost around £2-5.00 per portion. Make it your destination, especially on a Thursday night when Sean has time to pass on his recipes.